Welcome to our weekly recap of new movie trailers that have debuted this week. Dive in for all the thrills, chills, laughs, remakes and first looks below! Marvel Studios and Walt Disney Pictures have released the first Captain Marvel trailer! 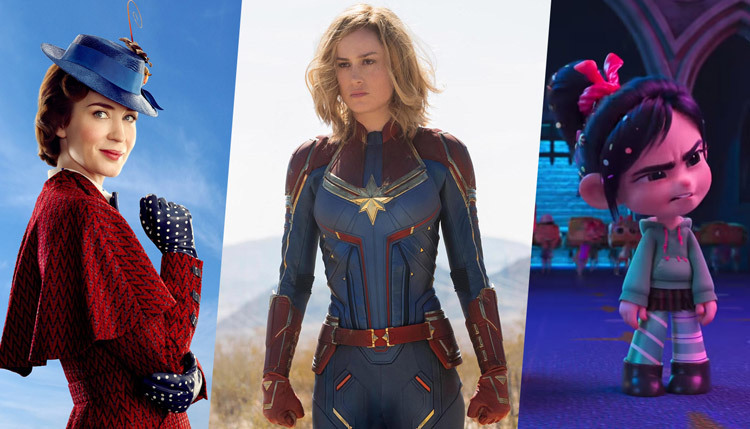 The superhero event film starring Brie Larson will debut in theaters on March 8, 2019. Walt Disney Pictures has revealed a brand new trailer and poster for their forthcoming musical fantasy sequel Mary Poppins Returns. The sequel is set to open in theaters on December 19, 2018. Walt Disney Animation Studios has released the second official Ralph Breaks the Internet: Wreck-It Ralph 2 trailer, which hits theaters on November 21. This one focuses less on the princesses and more on Vanellope’s quest to discover herself outside the realm of Sugar Rush. Sony Pictures has released a brand new trailer for The Girl in the Spider’s Web, the upcoming film based on the fourth book in the Millennium series. The film will be released on November 9, 2018. Universal Pictures has released a thrilling new trailer for the upcoming space exploration drama First Man, starring Ryan Gosling and directed by Damien Chazelle. Annapurna Pictures has revealed the first full trailer and poster for If Beale Street Could Talk, the latest from Oscar-winning writer/director Barry Jenkins (Moonlight). The film opens in theaters on November 30. Amazon Studios has released the new trailer for Beautiful Boy, starring Steve Carell (Battle of the Sexes), Timothée Chalamet (Call Me By Your Name), Maura Tierney (The Affair) and Amy Ryan (Bridge of Spies). Sony Pictures Classics has revealed the first trailer for the upcoming biopic Stan & Ollie starring John C. Reilly and Steve Coogan as the titular comedic duo. Annapurna Pictures‘ dark comedy/western The Sisters Brothers has revealed its final trailer and a set of four character posters ahead of its September 21 release date. Entertainment Studios has released a new trailer from their forthcoming sci-fi thriller film Replicas, starring Keanu Reeves (John Wick 3: Parabellum), Thomas Middleditch (Silicon Valley), Alice Eve (Star Trek Into Darkness), Emily Alyn Lind, John Ortiz and Emjay Anthony.